Say your query retrieves 2 columns - one containing the file name, and another the file data. To name your files using the file name value, simply use the column name as the naming convention. 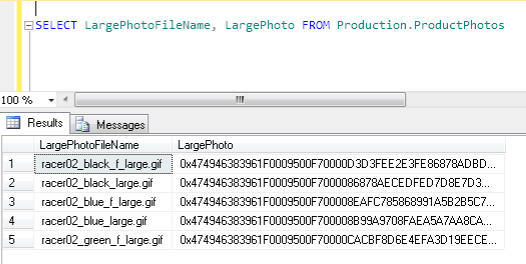 SQL Blob Export then uses the value found in the LargePhotoFileName column to name the files. Sometimes, you may want to link a file with a primary key. In this example, we retrieve both the primary key and file data. To name the files using the primary key column, just use the column name in the naming convention. What if you wanted to format the numbers to 4 digits? SQL Blob Export supports the use of format specifiers. To format a number to 4 digits, use the format specifier :0000 e.g. It’s often the case that the column containing the original file name also contains the original path e.g. Thus, you cannot use the value in the LargePhotoFileName column to name your files if the path does not exist. To name your using using just the file name value, you can use the FILENAME format specifier e.g. What if you had 2 binary data columns in a row, and you wanted to name each item differently? E.g. All you have to do is use the conditional column tag in the naming convention. 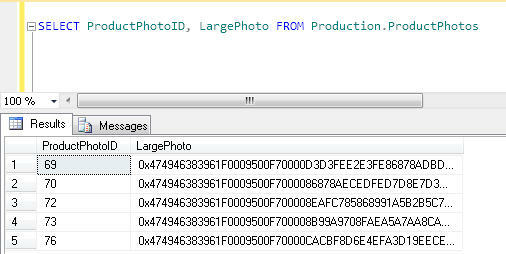 In the example below, we use the convention: <ThumbnailPhotoFileName::2><LargePhotoFileName::4> This tells SQL Blob Export to use the ThumbnailPhotoFileName value if it is currently naming the item from column 2, or use the LargePhotoFileName value if it is currently naming the item from column 4. If you have any questions on how SQL Blob Export can name your files, or any other general questions, do drop us a line at support@yohz.com.